My graduate studies are dedicated to understanding the prevalence and importance of deep rooting by tropical trees in Quintana Roo, Mexico. This region is an ideal location for this research due to the occurrence of deep rooting across the landscape as well as the unique opportunity to study roots directly via caves. Limestone bedrock is the foundation of the Yucatán Peninsula. 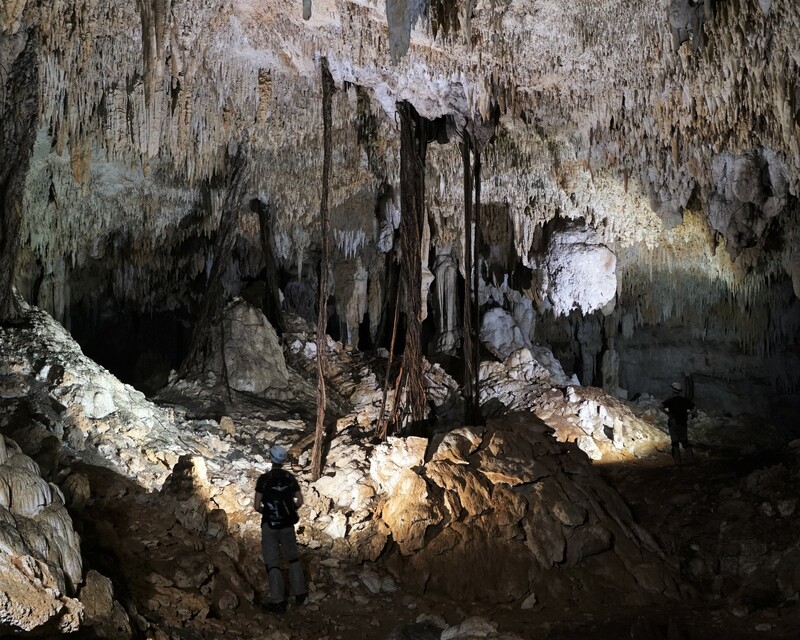 Along the Caribbean coast in the state of Quintana Roo, the dissolution of limestone by precipitation and tidal forcings has formed innumerable caves over thousands of years. These caves offer direct access to the shallow freshwater aquifer that underlies the entire peninsula. This is crucial as surface bodies of water such as rivers and lakes are scarce. The porosity of the limestone rapidly transports precipitation underground, supplying the caves with water. 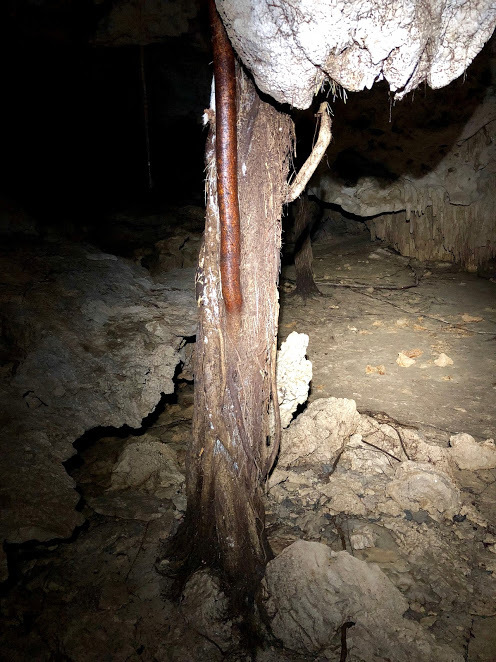 While in a cave, tree roots can be seen emerging from the ceiling and walls, exploring below ground spaces for nutrients and water. Trees have been growing roots into the caves here for some time, as evidenced by calcite formation on roots and sometimes complete incorporation into cave formations. As the region has a seasonal climate with a distinct dry season, water access is key for survival in the Yucatán. Globally, deep rooting has been identified as an important plant trait in water-limited ecosystems because of the ability for a tree to reach reliable water at depth. It has been shown that trees with deep roots perform better during dry periods or droughts compared to those without. Despite the fact that this phenomenon occurs in Quintana Roo, it remains significantly understudied here. My research aims to determine which species can grow deep roots into the caves and how their access to groundwater impacts the above ground forest composition and productivity. This work is rather interdisciplinary, combining plant physiology, speleology, hydrology, stable isotopes, and genetics. For more information about my work and lab group, check out the Dr. Jason West Lab website. Caver in foreground looking up at roots extending from cave ceiling. Photo by Sean Lewis. Intertwined roots emerging from the same conduit.